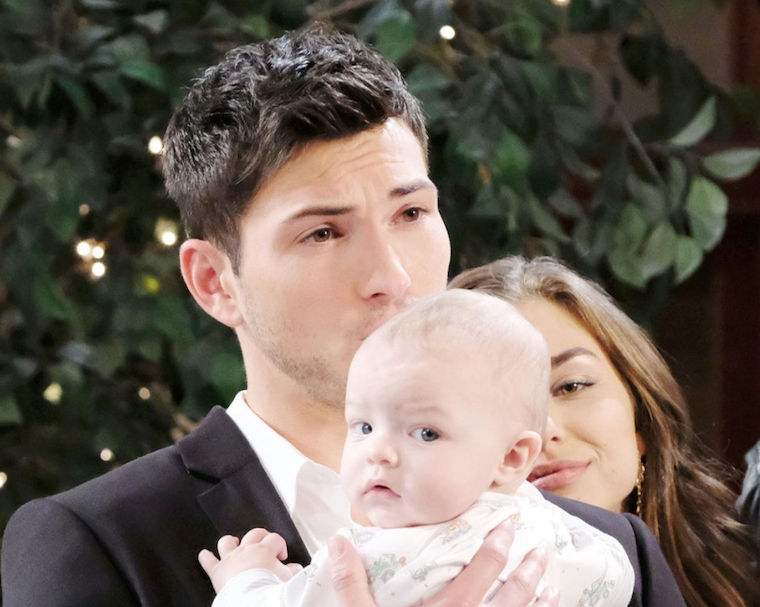 Days of Our Lives spoilers relate that the two weddings of Salem aren’t looking too good, and Ciara Brady (Victoria Konefal) is still standing by Ben Weston (Robert Scott Wilson). If you missed your Days of Our Lives spoilers on Friday, let’s catch up on the highlights in today’s Days of Our Lives recap. See, the pair had run into Claire Brady (Olivia Rose Keegan) while out and about, and Ciara showed no love for her. This is even when Claire goes fishing by going on about how hard this fake wedding thing is for her. Yeah, no “Poor Claire” here. Ciara is defensive of Ben, and even hostile toward Claire. When the subject of the lighter comes up, it seems even clearer that Ciara might have Claire on the suspect list. Lord help Claire if she’s caught and Ben finds out. So, Jack Deveraux (Matthew Ashford) decided to take Jennifer Horton’s (Melissa Reeves) out and rushed back to the hotel room he shares with Eve Donovan (Kassie DePaiva), who has been desperately looking for him. She gives him a little grief for not being there, but Jack is not in the mood. He goes off about what Jennifer did, which leaves Eve thinking Jennifer is “cray craay”. Ha! One, look who’s talking. Two? Jack points out that Jennifer was actually reenacting one of his own stunts. He gives Eve the details of the memory that returned, his being let out of the room, and how he’s staying the course. What they don’t know is, Adrienne Kiriakis (Judi Evans) has a plan. She arrives and tricks the pair into thinking that she’s all ready to support their union. She even offers to officiate the ceremony. We’re guessing those papers she (very briefly) flashes aren’t proof she’s ordained. We’re surprised that Eve goes along with this, and doesn’t even demand a better look at the papers. Later on, everyone is gathered for the big event, which quickly turns into a Jack Deveraux campaign rally, which Jennifer is quick to call out. Jack and Eve decide to get this show on the road, and Adrienne begins the (probably fake) ceremony. It turns out that whether Adrienne is ordained or not doesn’t matter. Jack freezes when it’s his turn, watching Jennifer. He ends up telling Eve he can’t do this. Meanwhile, the other wedding isn’t going so well, either. The ICE agent, Laverne Smith, shows up at the loft for the big day and immediately questions why JJ Deveraux (Casey Moss) is there alone with the bride. They do their best to cover, but she’s clearly not believe it. She gets increasingly impatient and suspicious the longer Tripp Dalton (Lucas Adams) takes to arrive. Once he does, he’s cornered by Claire, who actually think he’s planning to have her at the wedding. Right. Because the disgruntled ex being there won’t look weird at all. She instead talks him into at least giving her a kiss before he leaves to marry someone else, getting busted by JJ. What Tripp doesn’t know is, she’s recorded the whole exchange. As the ceremony gets underway, Claire races in and calls for them to stop. Oh, wow. She’s even crazier than we thought. Tripp is not going to be happy about this.